Employment Background Screening Services | AccuSource, Inc.
Smart organizations invest in good employees and one of the most valuable assets a business has is its people. Every time a company brings on a new hire it is betting its time, training, money, and resources on the hopes it has made the right hiring decision. But how can a hiring manager know that the person they hired is the right fit? Running comprehensive background checks on all potential hires can identify red flags in an applicant’s past and is the best way to ensure that your business is making informed hiring decisions. The human capital of an organization is an investment, and just like any other financial investment, it is crucial to perform proper due diligence prior to making any decisions that may affect the company’s bottom line. What are background checks: The process of investigating an applicant’s background including criminal records, credit history, past employment and education verification, identity verification, driving records, and screening for drug use. When is the background screening process initiated: A background check should be done during the hiring process. Generally, an organization will extend an offer of employment to a candidate contingent on the candidate passing a background check. Why do companies run background checks: To ensure that a candidate is qualified for the job and does not pose any kind of threat to the company, its employees, or its customers. How does one order a thorough background check on a potential employee: The most important step in the background screening process is finding a thorough, legally-compliant, and trustworthy background screening firm. Once an account is set up, screens can usually be ordered through an online portal to expedite the process. Most background screenings start with a Social Security Number (SSN) Trace. This report finds all name and addresses associated with the specific Social Security Number provided by the job applicant. One way of obscuring one’s shady past is to omit past addresses or aliases on a job application. With the SSN Trace, all addresses and AKA’s linked to a Social Security Number will be known. A SSN Trace provides independent verification of name and address history that can be used when searching for criminal records, as well as identifying that the SSN is valid and that the applicant is not using someone else’s SSN to conceal derogatory information. Organizations are responsible for ensuring that a potential hire is not a threat to employees or clients. Because many applicants with criminal histories may do their best to omit pertinent information or cover up their shady pasts, the only way to be sure that a candidate is not a safety liability is to run a complete criminal history check. With more than one in four adults in the US estimated to have criminal records, it is imperative that businesses do everything in their power to protect their employees, their customers, and their reputations from the potential fallout of a bad hire. If your business requires your employees to get behind the wheel in order to do their jobs, it is crucial to ensure a clean driving record. Any industry regulated by the Department of Transportation (DOT) requires a new copy of each driver’s Motor Vehicle Record (MVR) yearly. Ensuring that your employees are safe drivers is in the best interest of your company, as well as every other person on the road. An MVR will generally show any information that appears on a driver’s license, along with more detailed information on accident reports, traffic violations, license suspensions, and more. According to a survey from CareerBuilder, 75% of HR managers have discovered a lie on an applicant’s resumes. The most common untruth appears to be embellishing skills or capabilities. With so much disinformation out there and only the candidate’s word to go on, how does one ensure the person they are considering hiring is qualified for the job? Education and Employment Verifications mitigate the risk of hiring unqualified and untruthful employees. By personally reaching out to every academic institute and past employer listed on a resume, AccuSource’s verifications specialists can confirm an applicant’s suitability for any job. When considering a candidate for a fiscally sensitive position it is important to consider how they handle their own money and financial obligations. The difference between hiring your next superstar and putting your organization’s future at risk could be a pre-employment credit history check. A credit check for employment does not reveal the applicant’s credit score, but it does give the employer insight into a potential hire’s pecuniary life and could reveal signs of financial distress that might indicate the risk of theft or fraud. The employer credit report does not disclose the credit score or any account numbers but does show payment records, any amounts owed, and available credit. According to a study by the National Council on Alcoholism and Drug Dependence (NCADD), 70% of the estimated 14.8 million illicit drug users in the US are employed. Maintaining a drug-free workplace is a fundamental step in ensuring workplace safety. Implementing and enforcing a drug and alcohol screening program has been shown to reduce the risk of drug-related work accidents and also contributes to a healthier, more productive work environment. Screening employees and potential hires for illegal drug use is a relatively simple process, but can pay massive dividends when done correctly. Upon ordering a drug test, the candidate will receive a consent request and instructions for completing the test at one of more than 10,000 nationwide testing locations. The results of a drug screening are generally available to the employer within 1-3 business days, and all results are verified by a Medical Review Officer (MRO) to ensure accuracy. [Our large staffing firm] uses AccuSource because they produce results. They don’t just sell a service, they ensure it fits our business needs. Their technology integrates seamlessly with our workflow and desktop software so our team spends more time recruiting, and less time dealing with background checks. Our account manager is responsive and technology people proactively involve us. That makes them the standard by which others are measured. 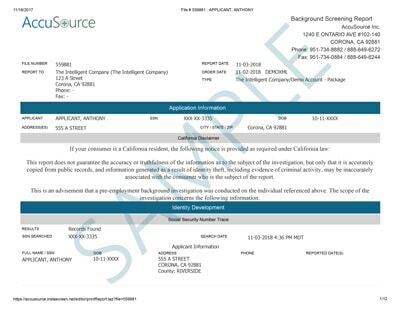 AccuSource is my trusted partner for my employee background screening. I utilize their services not only for the background screening but also for post-hiring I-9 and E-Verify compliance. Their platform is easy to use, streamlined, and efficient. Their customer service is best in class-they are there when I need them and I feel like a valued customer when they reach out to just see how things are going. AccuSource keeps me up to date on compliance changes and makes sure I am always in the know! A background check during the hiring process can investigate many different aspects of a potential candidate’s past depending on what the employer is looking for. Checking an applicant’s background might include past employment history, education history, credit reports, criminal records, motor vehicle, and license records checks. Each of these services will return unique information specific to the search being done. Depending on whether the employer is hiring for a particular department or level of management a comprehensive background screening program would take into consideration questions such as: What is the level of risk? Is there a fiduciary responsibility in the job? Is there necessary training or education required? All of these considerations can help an organization decide which aspects of a candidate’s past are relevant and worthy of being looked into. A delay may occur if AccuSource has difficulty establishing contact with your former employers or educational institutions. In such cases, AccuSource may ask you to supply a W-2 or additional information to help substantiate the information in your application or resume. Having this documentation handy and providing it quickly will help speed up the process. Delays may occur if courts are inundated with requests which can cause backlogs. If an employer is requiring drug testing, a Medical Review Officer may contact you regarding a sample’s results. International background searches might require additional information which can delay the process. International criminal searches and employment or education verifications will typically require more time to receive a response. Most employers know the value and perform some form of employment background check. The employer decides what searches to include in the background checks performed on their potential hires. The type of business or the position to be filled are among the factors which may be considered by the employer in determining what is included in a background check. The risk and budget for any given position or industry helps determine the use of a Consumer Reporting Agency CRA (background company) or performing selected services in-house. Regulated industries such as transportation and health care have very stringent screening and testing requirements dictated by various laws. Contrary to some common misconceptions about background screening, there isn’t a single centralized government database that houses information about you that is accessed by commercial background screening companies. Each service provided are access directly from the source that maintains the information. For example, criminal records are housed at courts, education records are housed with the educational institutions and driving records are maintained through each state’s Department of Motor Vehicles. The scope of a pre-employment background check can vary widely from employer to employer. Even the type of position sought and the employer’s industry can impact the breadth of the screening components contained in a specific screening request. The types of services or products contained in each background screening request has a significant bearing on the types of information required to facilitate research. In a standard criminal history background screen, most Consumer Reporting Agencies (CRAs) begin with a social security trace (SST) or address locator search to identify any previous addresses or alias names associated with the applicant. The applicant’s social security number (SSN) is generally required to conduct this type of search. Additionally, applicants are asked to provide their full legal name, date of birth and at least 7 years of address history. The address history (both developed by the SST and applicant-provided) aids in determining the courts searched for potential criminal records. Most criminal records are indexed by the defendant’s name and date of birth. Once a potential record match is located, additional information is sometimes required to confirm the record match. Employers often request additional services to meet their specific screening needs. These services commonly include verification of employment and education history, verification of professional licenses, personal and professional references, and driving records. Each type of search has its own set of search data required to ensure a quality result. No two employers are completely alike in their program needs and organizational requisites are ever-evolving.